Focus on the Do, Hunt Pitches, Get Your Mind Right, Decide/Clear/Breathe/Attack, Focal Point Breathing, 6th Tool and 5 Tool Navigation. 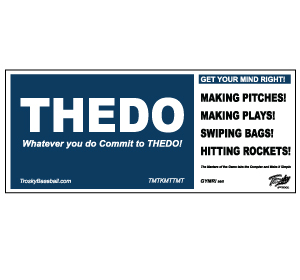 Trosky Baseball Ranch offers unique banners to help your facility to improve motivation for athletes with Nate Trosky acronyms and tool development. These banners are influential in developing purpose and processes associated with each workout and a focus on tool development.